“WRITING FOR YOU” releases tomorrow! What is the point of this writer’s handbook? Here’s the preface. I follow this author’s blog and she offers invaluable advice for aspiring and beginning authors. I highly recommend this book and fully intend to get my copy as soon as it is released! TOMORROW IS THE BIG DAY! 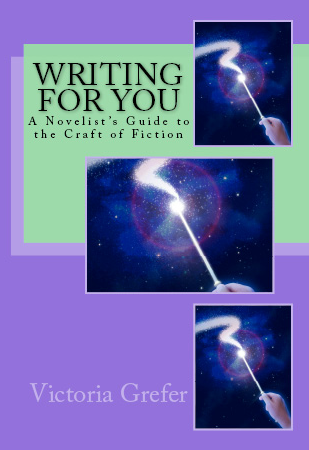 My writer’s handbook, “Writing for You: A Novelist’s Guide to the Craft of Fiction” releases on amazon.com. The ebook version will be on sale for a week for just 2.99, though the real list price I will set at 4.99, so make sure you get your copy right away to save. Today, I wanted to share the first part of the preface with you guys. It explains who I am, why I compiled “Writing for You” from my blog posts, and what the purpose of the book is. So, here goes. I hope you enjoy the sneak peek! If you’re reading this preface, then you’ve either bought my book or you’re considering buying it, and I’d like to thank you either way for giving me the chance to speak to you, from the heart and from my experience, about creative writing. When Victoria stated that on her blog today, I was stoked! It’s going to be an amazing book! PS….I have my Contest Essay Posted on my Blog, would LUV your thoughts!